One concern I have with the phrase “food forest” is that it implies that the rest of the forest is inedible. Nothing could be further from the truth, at least in Iowa. Upland forest canopies are dominated by oaks and hickories, with a handful of butternuts mixed in. The midlands are full of mulberries, black cherries and black walnuts. Even the bottomlands, with their thick stands of silver maples and lindens, are full of edible life. Linden blossoms are delicious in tea, and provide a valuable food source for pollinators. In most landscapes, I focus on the natural history of the land, and ask what would be here, if we hadn’t cut the trees, grubbed out the roots, and planted corn in the heart of the forest? What is missing from both this particular plot, as well as the surrounding areas? What would increase the native diversity and resilience of the ecosystem? In a food forest, I narrow that focus to species that 1) are native to the area, and 2) are fairly straightforward for humans to eat. A food forest has a greater concentration of native edible species than you might naturally find in a woodland. Done properly, a guest wouldn’t necessarily notice they were in a food forest; they would simply notice that they were in a beautiful woodland with abundant opportunities for them to forage as they walked. People are so far removed from what is and is not edible without a plastic wrap label and a price tag on it, I’ll probably need to put out signs. There isn’t much point, if people don’t know that the food in the forest is there for them. 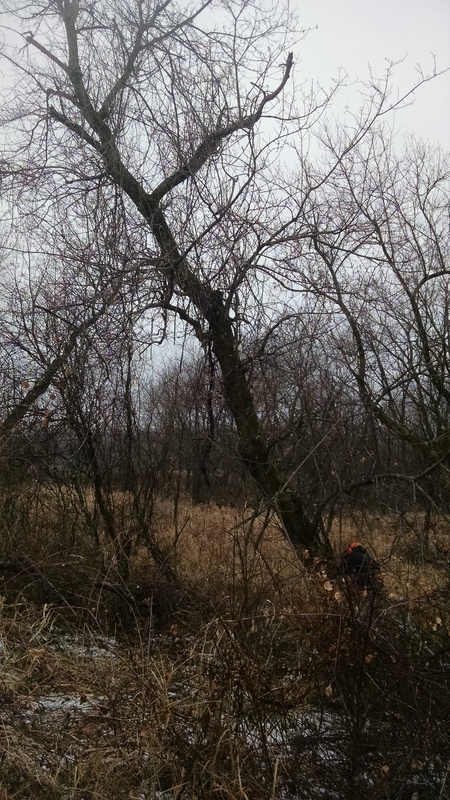 A box elder tree comes down to make room for a new black maple tree. We have far more box elder trees on the land than we do black maples, so this will help create balanced diversity over time. The pocket of sunlight we created this winter will be planted to maples this spring. I am locally sourcing Black Maple from Fleming Nursery and Sugar Maple from Hughes Nursery. Just downhill from the clearing is a large silver maple, well-suited to flooding. Mulberry and black cherry are already growing in the area, and we planted butternuts last year.